Sold by Sunbelt Products and Fulfilled by Amazon. Gift-wrap available. 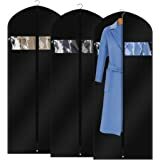 Amazon's Choice for "white garment bag"
HOLD MULTIPLE GARMENTS IN EACH 40” X 24” BAG: These bags are great for storing suits, tuxedos, winter coats, fur coats, costumes, uniforms, dance recital clothes, blouses, tops, skirts, pants, slacks and dresses up to 36” in length depending on the hanger. 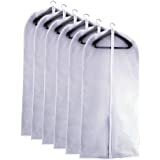 Each bag can hold multiple blouses or dress shirts for maximum use. USE IN CLOSETS OR WHILE TRAVELING: Each bag completely covers clothing, making them great for travel by plane, bus, car or train. 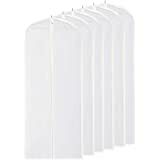 The non-woven material helps protect clothing from most environmental conditions but is still thin enough for bags to be stacked or folded. 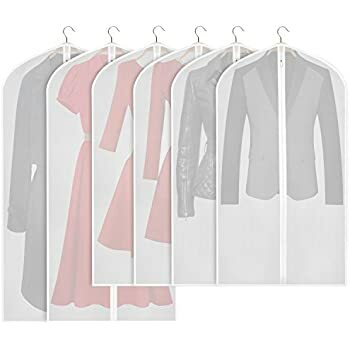 TRANSPARENT WINDOW TO KNOW WHAT’S INSIDE: These bags are not transparent, but each hanging garment bag includes a small, 3 x 5 inch window that allows users to see the contents in each clothing bag. 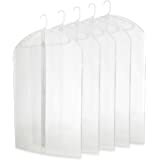 This window doubles as a small storage sleeve to hold name tags or accessories. 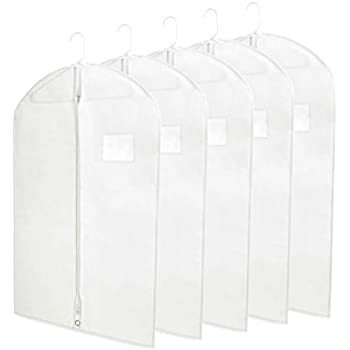 PROTECT AGAINST DUST AND INSECTS: These bags are breathable but keep clothing such as fur coats and leather jackets protected and preserved. 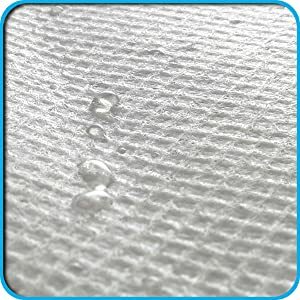 They also help shield garments from common pests like silverfish and moths and prevent common pollutants such as dust, pet hair, light exposure, humidity, moisture or mold from damaging clothing. 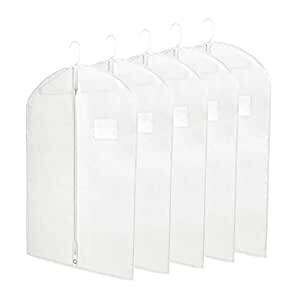 FOLDABLE FOR A VERSATILE STORAGE SOLUTION: The protective cover these bags offer helps keep clothing clean and wrinkle-free. 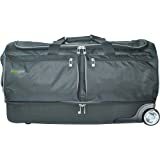 The front zipper enables easy access to garments and the opening at the top of the bag allows for a coat hanger—which can be hooked through the metal grommet at the bottom of the bag for more compact storage. Sold by Sunbelt Products and ships from Amazon Fulfillment. Protect your garments while traveling or at home. 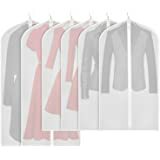 Plixio’s set of five 40-inch hanging white garment bags makes traveling with valuable suits and blouses easier on you and your clothes. Each bag measures 40” in length and 24” across. At this length and width, garments will be completely covered and protected for travel and storage. 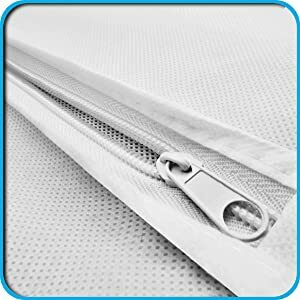 Made from a breathable, non-woven cloth specifically designed to protect clothing from any humidity, sun exposure, and pests such as moths or silverfish. 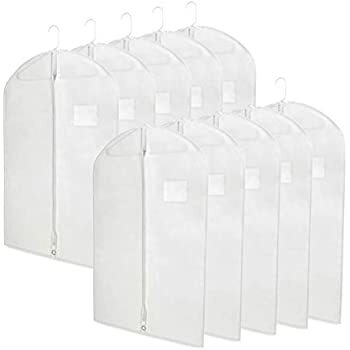 We designed these bags to be thick enough to offer your clothing full protection (90 grams per inch), but thin enough to be and stacked and folded for storage. 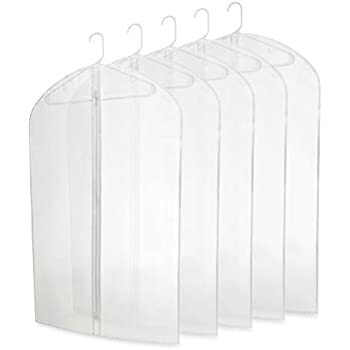 Their thin construction makes it so they take up the least amount of space in your suitcase or closet. 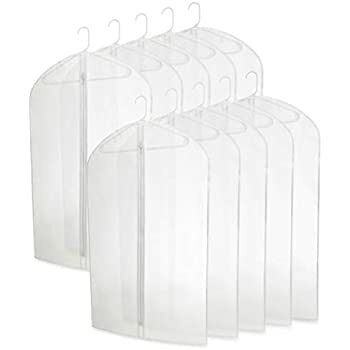 As an added bonus, when folded over once, these meet overhead compartment restrictions for most airlines. They’re also ideal for dance or recital costume storage and can be easily hung up and stored backstage. 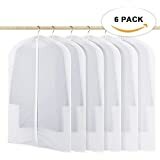 Multiple pieces of clothing can be kept in each bag and the carefully placed opening at the top of the bag and metal grommet at the bottom, makes hanging each garment bag simple. Reinforced zippers make your garments easy to access and keep them secure. Use the viewing window to easily view garments inside the bag or to label your garments. These are a good value for the price. They are made of some sort of cloth-canvas material that I think is sturdy enough for its use. Unlike some cheaper ones I have used, they don't have any unusual smell. They have a little window so you can kind of see what's inside. Frankly, if it's dark clothing, like the jackets I put in them, it's hard to tell. They zip from top down. They are sized for jackets, pants folded in half, and shirts. Not for anything longer. Check out the video tour. 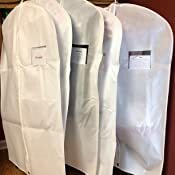 I bought these garment bags for my husbands suits, mainly to keep the dust off them since he doesn’t use them that often. The only thing is the material is a little thin in my opinion but for the price they are pretty good. I took one star off because of the material but regardless they are still a good buy and the price is great. Most of the garment bags I found were black which I am not a fan off, and plastic which I also didn’t particularly care for either. 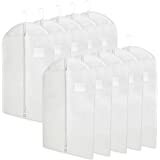 This are perfect for what I needed which was keeping dust off. 5.0 out of 5 starsTexture of bag is pliable and feels like fabric. 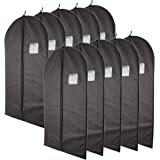 I'm using these to store jackets and clothing for winter. 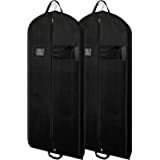 The bags comfortably hold one thick jacket and several thinner jackets. The zipper works nicely and the 'fabric' texture is pliable, exactly what I wanted. So far so good! These were purchased for dance recital costumes, so we’ll see how well they hold up in couple weeks! 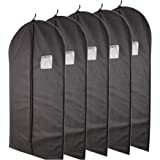 5.0 out of 5 starsGood value garment bags. Very good value and they are wide enough for a man’s suit. I can even put 2 sports jackets size 42 in one bag. We ordered other brands and they were very narrow. These are great and the bags seem well constructed. 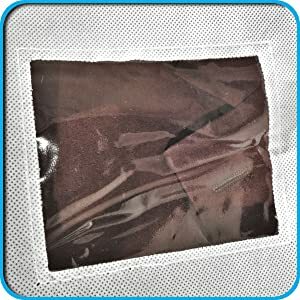 The bags are a thick, non-woven type fabric which is a plus (not plastic). Zippers work well and seams seem tight. Good purchase. Good quality bags for the price. No more dusty garments between seasons. Going to need some longer ones though!